The 2S3 Akatsiya (Acacia Tree) entered design in 1967 and went into production in 1971. 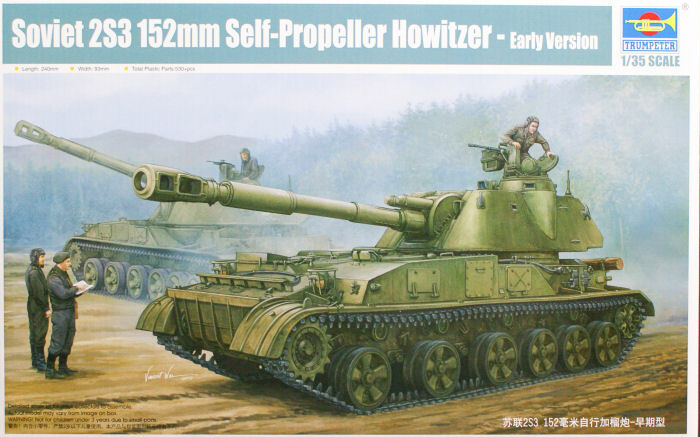 It was not observed by NATO until 1973 and was then dubbed either the M-1973 Howitzer or SO-152. These guns were fielded in 18-gun battalions and were allocated to the divisional artillery regiments, with a full compliment of guns being three battalions or 54 2S3 howitzers. The 2S3 can fire all types of 152mm ammunition with a regular maximum range of 18,500 meters. 40 rounds (a maximum of 46) are generally carried as a basic load, with a variety of projectiles in the selection including HEAT rounds for antitank engagement and "shrapnel" (actually "beehive" dart rounds) for use against helicopters. The 7.62mm machine gun is for self-protection against infantry, unlike Western SP weapons that use a 12.7mm machine gun for aerial protection. Approximately 4,000 were built between 1971 and 1993, but the weapon remains for sale (probably from storage stocks in Russia with rebuilding required before sale). They were sold to at least 23 different countries and were encountered by the Coalition forces in Iraq in use by Iraqi forces (the 110th SP Artillery Battalion of the 3rd "Saladin" Armored Division was equipped with 18 of them). The 2S3 is a popular weapon and has been forecast as a kit for several years now with first SKIF and then ICM offering it, but neither one saw the light of day. Trumpeter is now releasing at least two versions of the gun (probably the 2S3M1 variant will follow, but the M/M1/M2 are very difficult to tell apart) with the initial 2S3 being the first kit. The model follows most common parts breakdowns and uses "slide molding" to achieve a great deal of surface detail. Several of the parts trees are wrapped in expanded foam for safety in transit in order to protect those details, including tabs on the rear of the stern plate (E1). Suspension detail includes separate bump stops and shock absorbers and snap locks for the tow hooks. The suspension includes wheels with the "mold line" school of surface details (why I don't know, as the ones I have seen up close did not have them). Tracks are single link but snap together to form runs; pins are tiny and I suggest using liquid cement to "freeze" them in place once done. Four shipping chocks (A10-B3-B5-A2) are mounted on the right rear fender. All hatches and access ports less the engine deck are separate parts, and there are two PE grilles included for the main engine radiator intake and exhaust. There are literally dozens of separate fittings and bits that go on the model, and all of them are TINY. Some are nicely done, such as one piece headlight guards (B33) for the headlights (foam protected on the sprues). The main gun barrel, recoil buffer and recuperator are all two-part styrene parts so prepare for a session with a Flex-I-File to get a smooth surface. The massive muzzle brake is well done and Trumpeter has tried to minimize the amount of filling and sanding needed inside it. The commander's cupola has a nicely done PKT machine gun and consists of some 24 parts. But there is not a bit of an interior in the kit, and this is a bit of a shame for anyone wishing to show the gun in action. The 2S3 was notoriously smoky inside and some crews noted after as little as three rounds they were starting to feel faint from the buildup of gases. As a result, most of the time when firing the side doors were opened for ventilation (the bore evacuator on the gun tube is a giveaway this weapon had problems getting propellant gas out of the turret). Finishing directions are included for two guns: one in "parade" finish of protective green and white trim with Guards badges, and one in the new three-color (black, green, sand) camouflage with Guards badges. All guns should have a three digit "bort" number on them with the last digits being 1-6 for the gun's position in the battery; some units used 1 for the first battalion (and 1-2-3 for batteries), 2 for the second (4-5-6) and 3 for the third (7-8-9). So 264 would be 2nd battalion, 6th battery, 4th gun. Overall this is a lovely kit and one well worth the wait!